It’s just another birthday. That’s what I keep telling myself. As yet, there is something auspicious about the number 55 that bears reflection. Not that it HAS to have any special meaning, I just feel it and know it is connected to something that is hovering at the edge of my consciousness. I’m in the process of feeding the animals, making the coffee, my usual morning routine and what comes to me, oddly enough, is the image of the spool of thread I recently finished. 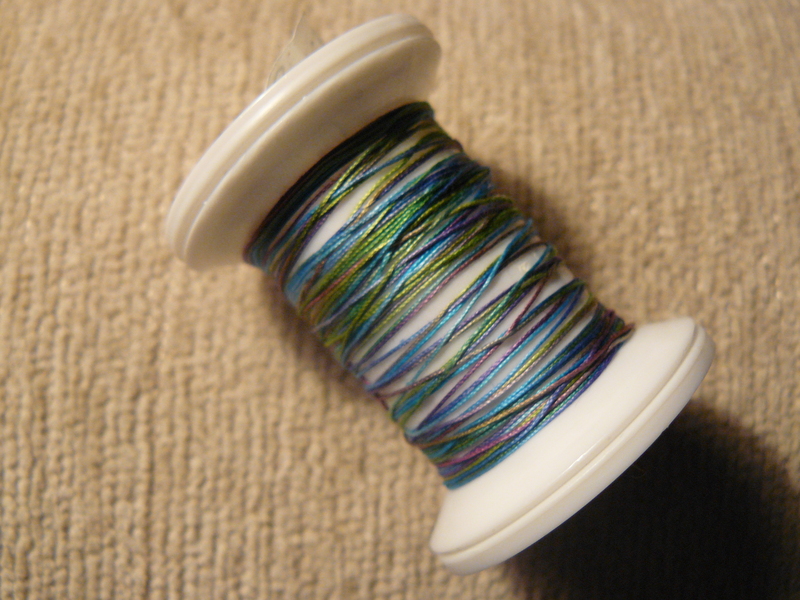 A truly beloved spool of thread, if there ever is such a thing! 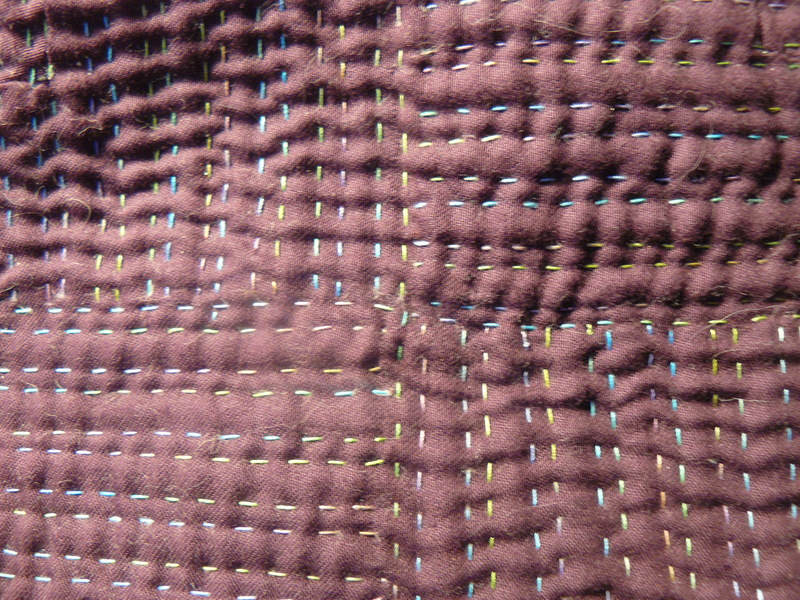 It is thread I actually dyed myself in a workshop ten years ago (5+5=10), I remember being thrilled with the result, and the quantity produced. There is something just perfect in the weight, feel and variegated color of this thread that has continued to call to me all these years, and the shades blues, greens, and purples that have added a kind of shimmer and depth to each of the three quilts it has graced since. I was able to make three full spools of this thread from my dyeing exercise years ago, which has translated into countless hours of hand quilted stitches and I’ve been aware for the past month that I am rapidly approaching the end of the last spool. There’s nothing in this simple offering that I haven’t already considered and yet, my brain finally stops and I feel the truth rise up out of the knot that holds my heart in check. I tenderly gaze at the love that I just yesterday set a clear boundary with. It is a love that I have been distancing myself from for months now, only to realize the more I distance myself, the more attached I feel. Not unlike the creative space that opens now with the this last bit of thread winding off the spool, establishing a firm boundary and closure in love, makes space for the knot to loosen and allows me to begin to breathe fully again. And, creates space for me too to enjoy all the wonderful birthday phone calls I have been receiving all morning! So blessed to be here at 55…. Kathy! How beautiful!! and Happy Birthday! It struck me as I looked at that spool of thread that I had seen those colors before and I went back to your blog of January 14 “Magic” and looked at the gorgeous bowl your mother gave you and then scrolled down to the picture of labradorite that you included in that blog. I had to open another web page to have the two images on my screen at the same time, but that spool of thread and the colors of the gemstone were so close!! My heart skipped a beat. There are no boundaries to your depth of creativity and “magic”. Enjoy your day! Jean, I love how you have entered into the spirit of seeing the connection between the magic of the thread and labradorite…thanks for sharing! !